Pro series, with its outstanding stability and high-precision printing technology, is a high-speed range model dedicated to speed and beautiful printing. The new Tiger-1800B MkII is the successor model to the Tiger-1800B. New effective functions for high quality and high production and an additional print mode are equipped. 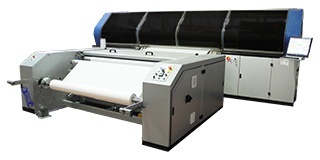 Product outline of Textile Printer "Pro series - Tiger-1800B MkII"
- Maximum print speeds of up to 385 m2/h in high-speed mode. - For the realization of higher quality of print, 1,200 dpi print mode is added and the multi-pass is applied. New! Mimaki Advanced Pass System (MAPS) delivers stable high-quality printing New! Depending on ink type and printing mode, there are 4 different droplet sizes. Droplet print mode can be choose to match the print data from high speed and standard mode. Nozzle recovery system (NRS): Consecutive operating solution to maintains the productivity New! * NRS is to be applied from December 2018. 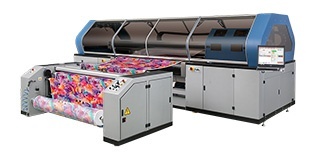 Extensive lineup of optional devices to be selected according to the type and status of fabric and transfer paper, including the storage after printing. Large-sized ink tank (10 kg) ensures cost-effective print operation. The bulk ink supply enables effective long-hour printing while reducing the operational cost. High-performance software RIP "TxLink3 Standard"
The TxLink3 Standard offers simple RGB and CMYK color replacement on raster and vector data, as well as the ability to produce different color patterns. Moreover, various color replacement functions can represent desired colors.